It is not the first time we talk about Schwarz Etienne on MONOCHROME. This independent brand, based in La Chaux-de-Fonds, shows an impressive level of integration – especially given its rather modest size. 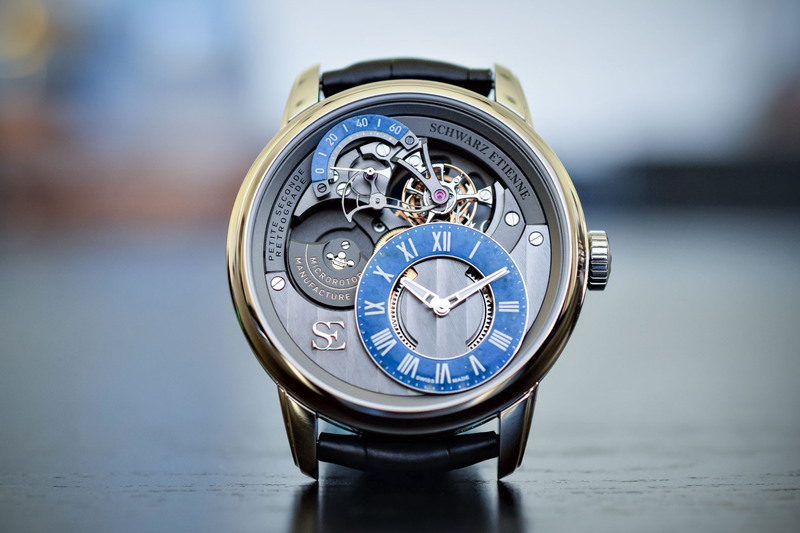 It is one of the few brands to develop and manufacture its in-house movements and parts, including the hairspring. 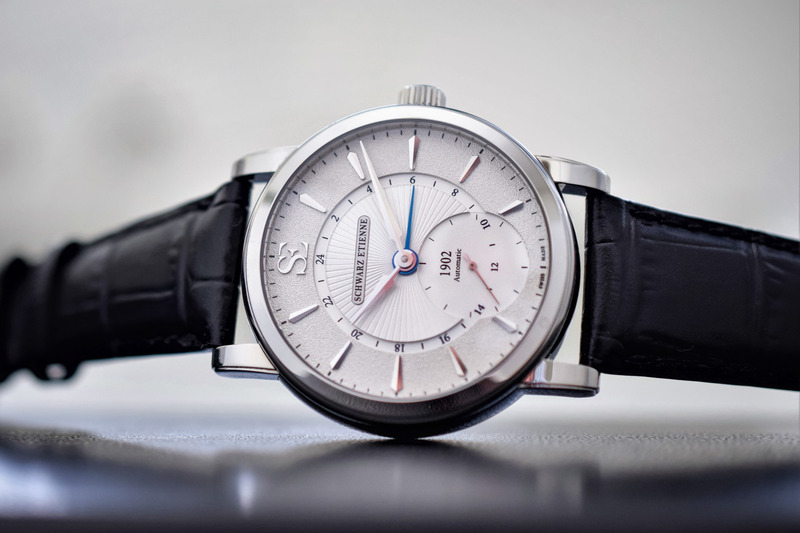 Today, we take a look at one of the classic yet highly pleasant watches of the Roma collection, the Schwarz Etienne Roma GMT. 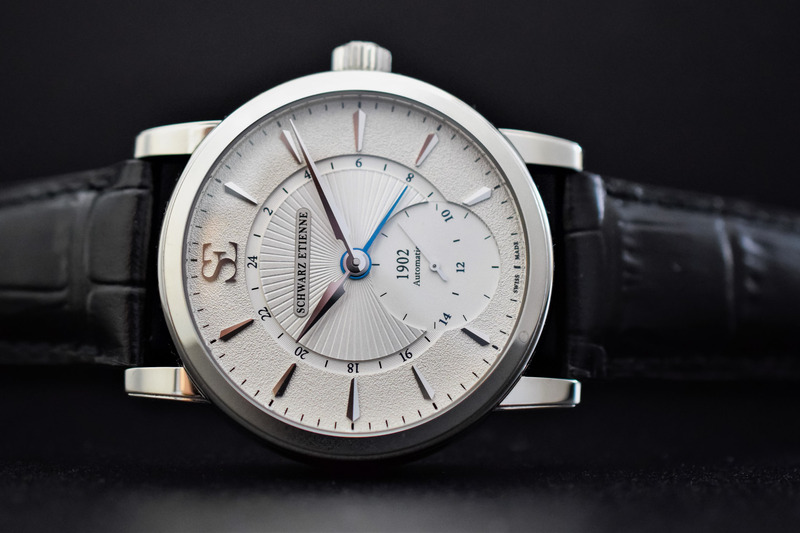 The watch we are reviewing here is part of the Roma collection, the classic line of the brand. 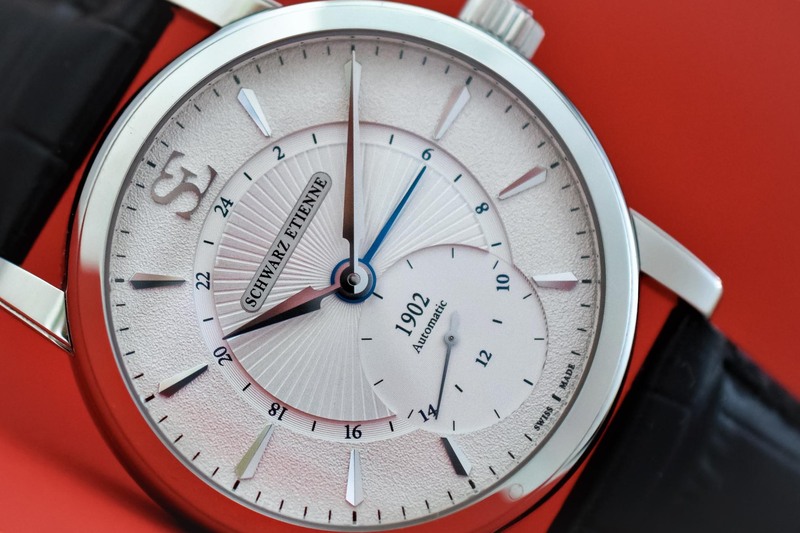 It comprises 3 models, a traditional three-hand watch, a power-reserve watch (reviewed here) and a GMT watch. The latter is a dressy and elegant traveller’s piece available in steel or in 18k pink gold. 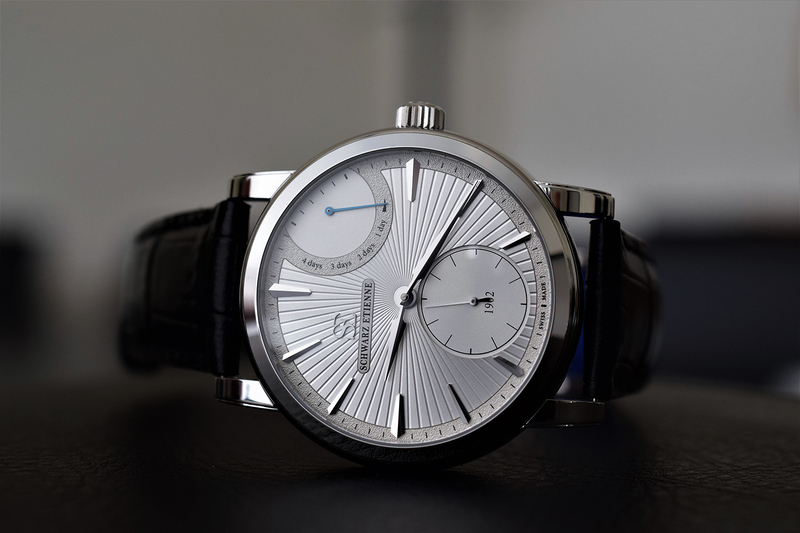 It is presented in a well-proportioned 42mm case with a slightly sloped bezel. The lugs are stepped on the outer edge. The exhibition case back is closed by 6 screws. The Roma GMT is powered by an interesting in-house calibre, the ASE 120.00 with automatic winding. It is part of the modular, multifunctional family of Schwarz-Etienne movements (the MSE, ASE, ISE and TSE all based on the same platform). Among its specificities, it features a practical central GMT indication and it is wound by a micro-rotor, cleverly integrated into the movement. 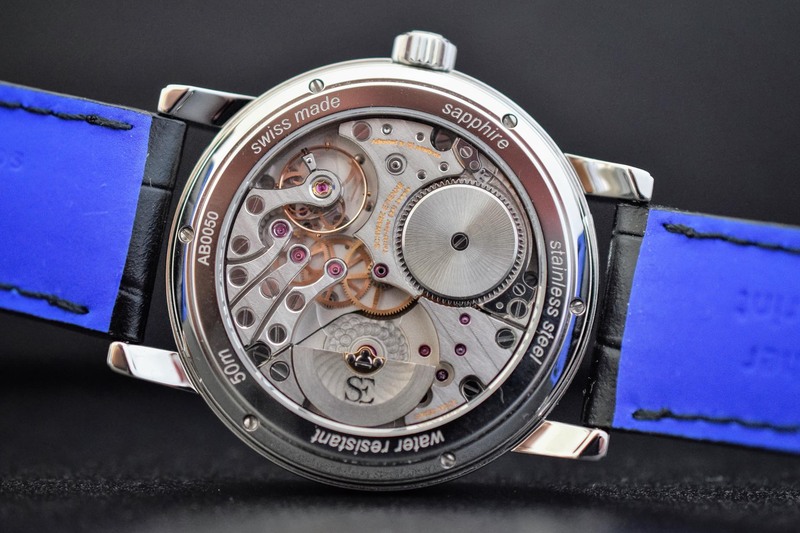 This elegant solution ensures that the movement can be perfectly seen through the caseback, without a central rotor partially hiding it. Also, it allows for more thinness. Each of the wheels of the gear train is held by its own bridge finished with hand-bevelled edges. The decoration includes Geneva stripes, perlage on the main plate or snailing on the ratchet wheel. 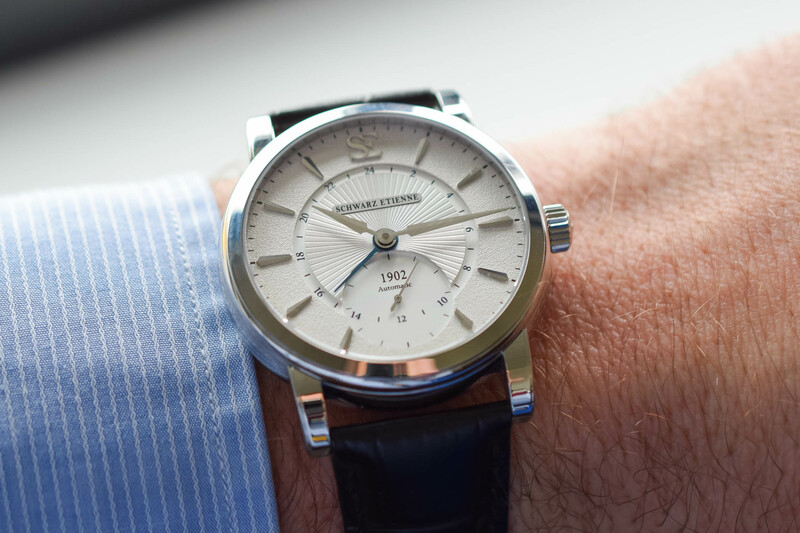 The free-sprung balance wheel is manufactured in-house and incorporates the brand’s SE logo. From a technical perspective, the calibre ASE 120.00 is 30.4mm in diameter and it comprises no fewer than 213 parts. The power reserve is of 4 days for a frequency of 21,600 vibrations per hour. 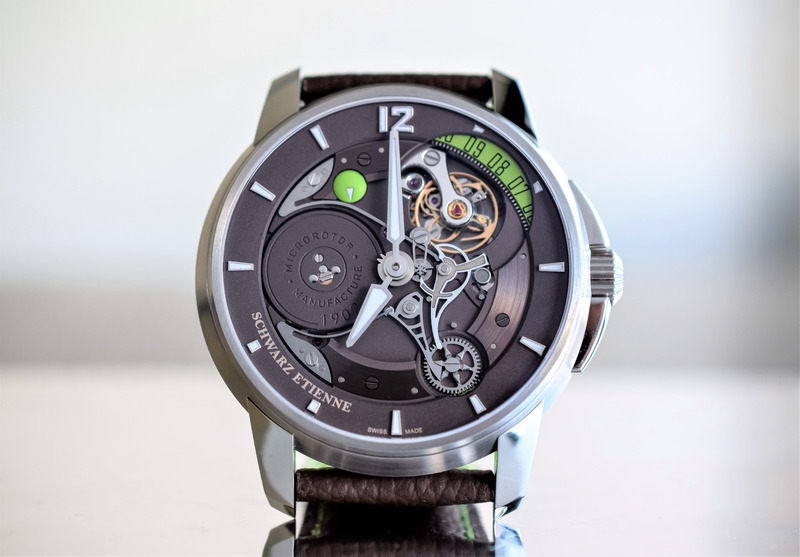 Important to know is that Schwarz Etienne is a truly integrated manufacture, where most of a watch component can be crafted, including one of the most complex part, the hairspring – read our article on how hairsprings are manufactured at Schwarz-Etienne sister company, E2O innovations, here. The clean yet sophisticated dial combines different textures and finishes to add depth and character. It is available in silver or black colour. The central part features a sunray pattern while the outer part is grené. 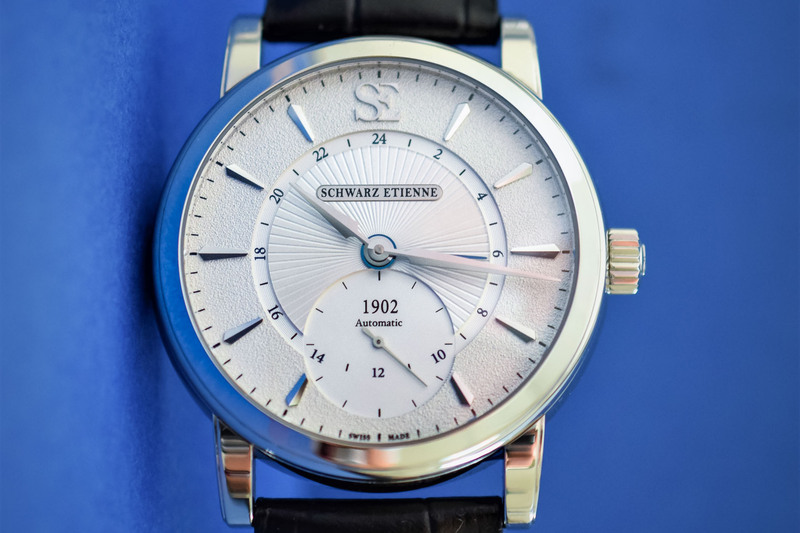 The brand SE logo is applied at 12 o’clock while a cartouche is engraved with the brand’s name. The faceted hands and applied markers contrast beautifully. A blued hand displays a second-time-zone on a slightly recessed 24-hour scale. All settings are performed via the crown. The position 0 is for winding. When pulling the crown to an intermediate position the GMT hand is adjusted in 1-hour increments. When pulling the crown completely, the three centre hands are moved together. The Schwarz Etienne Roma GMT is paired with an alligator strap with a colourful lining – a brand signature and a nice touch. It is secured to the wrist by a folding buckle. 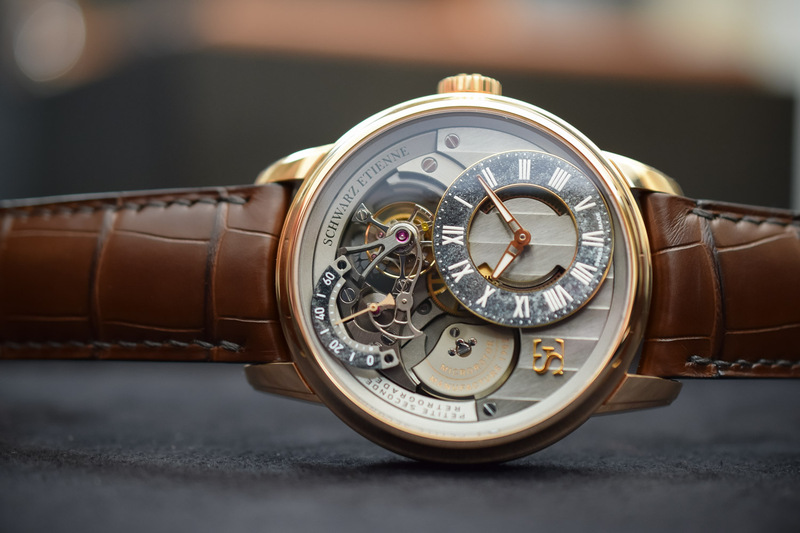 Price is set at CHF 11,500 in steel and CHF 26,900 in 18k pink gold. Overall, the versatile and practical Roma GMT has a lot to offer, specifically if, like us, you find independent watchmaking worthwhile. It features rather common functions but it feels exclusive, personal and crafted in a way you simply cannot get in large-scale productions. For more information, visit www.schwarz-etienne.com. I discovered this brand a year ago on Monochrome and I love it! 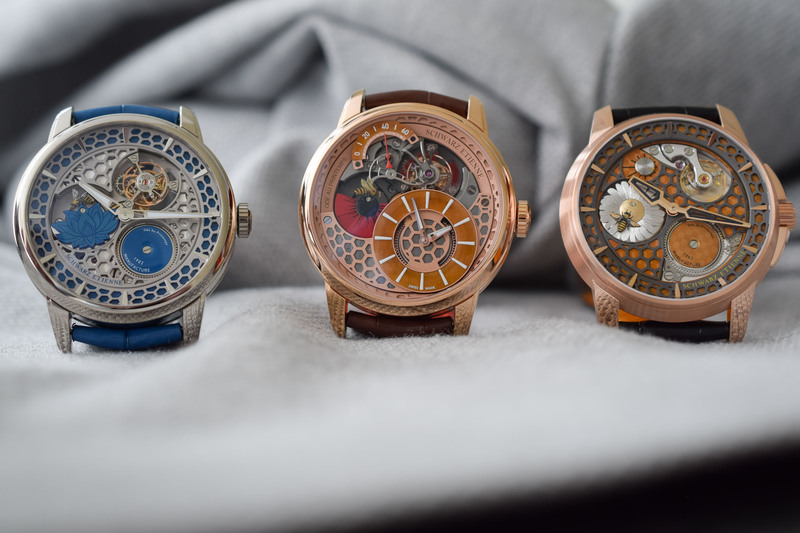 I checked their website and found amazing timepieces and a very nice value for money. Great article and very nice brand. @JD Since they ramped up things at Schwarz Etienne it has become a very interesting brand, offering so much more in-house production than many well-known high-end brand. Certainly well worth to take a good look at what they are doing. I agree 100% Frank. And thanks for your reply.